Last Saturday, Pabst Theater hosted veteran comedian Kathleen Madigan for a pair of shows, which doubled as a live filming for her yet-untitled fourth comedy special. Citing reasons like the city’s ease and affordability, the cheap beer and readily available brats, and the “wonderful” Pabst Theater, immortalizing her latest hour of material in Milwaukee made perfect sense for the Midwestern-born comic. Believe it or not, Madigan isn’t alone in thinking that. Not even counting popular live podcasts like RISK! and Comedy Bang Bang! recording episodes in town semi-recently, and Damon Millard coming home to record his album here last month, there’s a pretty impressive list of comics who choose Milwaukee as a place to record. 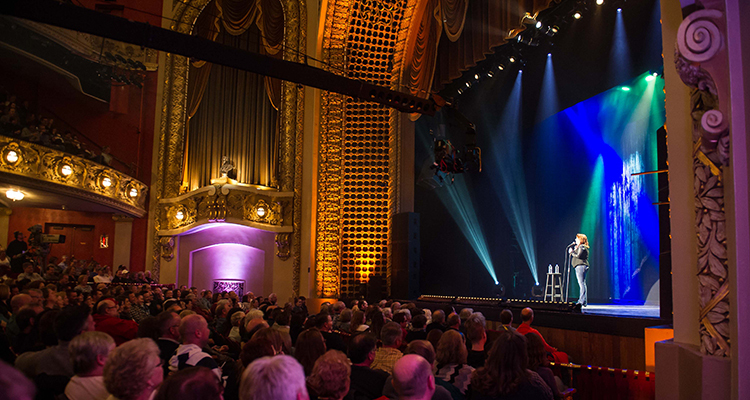 Within the last 10 years alone, a handful of talented comic commodities (and Jeff Dunham) have decided Milwaukee’s gorgeous and historic theaters, along with its passionate stand-up audiences make the city and ideal place to shoot a special. From Louis CK to Kathy Griffin and humorists all levels in between, here are seven comedy specials filmed in Milwaukee. As noted above, Madigan became the latest comedian to bring cameras into the Pabst when she shot a pair of shows Saturday night. After an opening set by friend Lewis Black—who has called Madigan “the funniest comedian in America, bar none”—to warm up both audiences, the star of the show came out to an uncharacteristically bright theater (to get reaction shots, no doubt). Some sections were removed to give camera operators more room. We’re told the filming went well. Where and when the special will be released is unknown at this time. Longtime comedian and runner-up on Last Comic Standing‘s first season Ralphie May is no stranger to filming his sets. At the moment, May has written enough material to populate an album, two Netflix specials, and a quartet of Comedy Central specials. Too Big To Ignore, the last of his four specials for the basic cable network, found the comedian at the peak of his popularity and, probably, his funniest before a Milwaukee crowd and a cluster of cameras at the Pabst Theater. For a self-proclaimed D-list celebrity, Kathy Griffin has amassed quite the career. Between 2009 and 2013, the actress and comedian released an astounding 12 specials, most of which were “live” (“with enough delay to work in the steady wave of bleeps”) telecasts on the Bravo network. In 2011, Griffin decked out Riverside Theater’s stage for the filming of 50 And Not Pregnant, the acerbic comedian’s 13th special. The 45-minute set found her brazenly tackling topics like Whitney Houston, Sarah Palin, Justin Bieber, and hate mail. It was later released as her fourth comedy album. Whose Line Is It Anyway? regulars and improv juggernauts Colin Mochrie and Brad Sherwood have an incredibly unique relationship with Milwaukee. Last month, the dynamic duo—who can be counted upon for at least one Milwaukee performance every year—performed their 20th show in the city. Given the special connection Mochrie and Sherwood have with Milwaukee, it’s only fitting they chose Pabst Theater as the filming site of their 2011 TV movie Colin & Brad: Two Man Group, which was shot in 2010 and aired the following year. Way back in 2010, Louis CK was midway through his transition from grizzled veteran New York “comic’s comic” to ultra-successful world-renowned humorist visionary. On the cusp of signing a deal with FX to make Louie en route to becoming a household name, Louis CK brought his latest hour and his swelling popularity to Pabst Theater to make Hilarious, a concert film directed and edited by the comic. The film, which appeared at Sundance and had single-night screenings in eight cities (Milwaukee not among them), featured some of the modern legend’s best material, including his famed “everything is amazing and nobody is happy” rant. In accordance with the 25th anniversary of This Is Spinal Tap, a comedy classic and pioneer of the “mockumentary” film genre (which actually was the basis for the Shank Hall name), famed director Christopher Guest and his co-stars/fictitious bandmates Michael McKean and Harry Shearer came to Milwaukee’s Riverside Theater in 2009 to play unplugged (and unwigged) renditions of Spinal Tap songs, along with a few cuts from A Mighty Wind, with a great deal of between-song banter thrown in for good measure. On a scale of 1 to 10, we give the special an 11. Remember Jeff Dunham? About a decade ago, the wisecracking puppeteer was at the height of his popularity, regularly packing arenas the world over with people eager to hear borderline racist jokes delivered by dummies who doubled as broad stereotypes. As Dumham neared his peak, he came to the Pabst Theater in the summer of 2008 where he shot Jeff Dunham’s Very Christmas Special before a crowd decked out in winter jackets and holiday sweaters. A televised companion piece to his debut music album, Don’t Come Home For Christmas, the special featured—honest to god—a song by (ugh) José Jalapeño on a stick, as well as (double ugh) Achmed The Dead Terrorist singing “Jingle Bombs.” Despite Jeff Dunham being the worst, the Milwaukee-made Comedy Central holiday special attracted 6.6 million viewers, which was the network’s highest rated special at the time.